Recently I was browsing AliExpress looking for ESP8266-related products when I spotted a bunch of epaper offerings, and I was surprised to see that they've become reasonably affordable. ePaper displays, comprising of the display itself and a small supporting driver are available in sizes from 1" to 4", with a reasonable price limiting you to 800x600 pixels in size. Have a display showing today's weather/temparture. 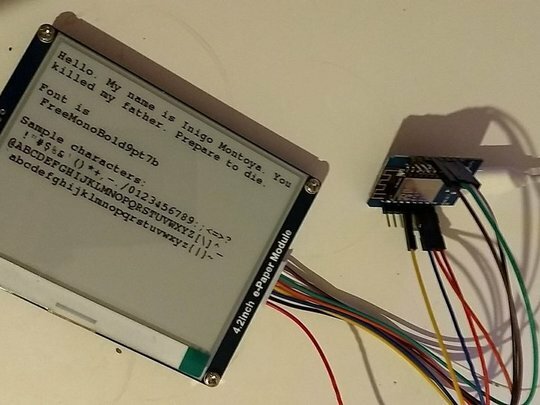 ePaper displays are very readable, and when they're not updating require very low power. That means that it should be possible to drive one from batteries for a reasonably long period of time. You batch up your operations in the middle, but the moment you call "update" it'll take 4 seconds for your display to show what you expect. That's either horrifically bad (you can't have a real-time clock with seconds-display) or acceptible depending upon your use-case. Wrapping is handled reasonably well. If you try to display a huge string it will wrap around to the next line. If you display a paragraph of text it will continue going until it falls off the end of the screen. If you wanted to implement some kind of scrolling no doubt you'd have "fun" working out how to calculate where the end of your string was, or breaking your text into lines such that you could move forward in a sensible fashion. 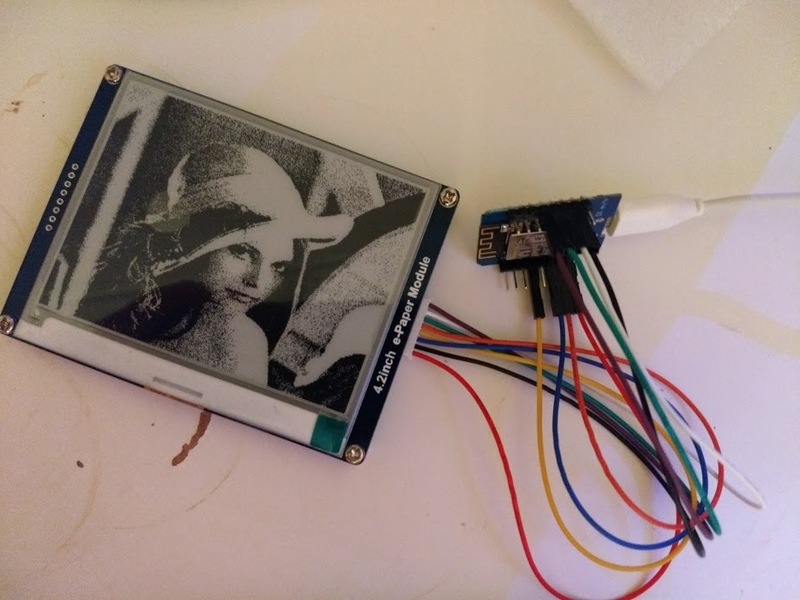 One thing that is certain is that downloading and decoding a JPG, PNG, or similar image format is going to be very hard on such a resource-constrained device as an ESP8266, however it is possible to display images if you're careful. Ideally you'd stream the image from the network, or via the SPIFFS filesystem. That's something I'm going to look at next. The library support we've just shown for displaying an image requires a continuous byte-array of graphics data. If we load the image from SPIFFS, or over the network, we'll have to create one with malloc. No doubt that would work just fine, but it will eat up the RAM which is a problem we're trying to avoid. My solution would be to pre-process the image we want to display, to turn it into a series of lines/pixels which can then be loaded over the network and parsed into a small buffer. This will be slow - rather than sending a bunch of data and saying "Draw this image" we'd instead have thousands of "draw a line here" operations. That said it should work, and it will avoid the need to malloc( 400x300 ) bytes of RAM. The final step will be to write a program to run on the ESP8266 device to make a web-fetch for this encoded data, and draw it. Then we can write a simple CGI-script to build up an image containing a calendar, etc, and the device can be programmed to fetch it every few hours. Here are the sample scripts, which use the Image::Magick library. Read an image, in JPG/PNG/whatever format. Process it row-by-row. Output a series of "lines" which can be used to rebuild the image. Read a series of "lines" which were produced by the above-script. Generate a PNG image of the result. The processing is very naive, iterating over every "line" of the image, and keep track of each successive pixel in the row. Fetching the file over HTTPS failed. My certificate/certificate-chain is too long. The remote server would drop my web-fetch at exactly 32678 bytes. It seems your browser does not support the video tag, so you should view the video on twitter instead! No doubt the code could be simplified and improved - but the important thing is that I had to use HTTP, and I had to ensure that I didn't allocate "too much" RAM. There is a static-buffer setup in the display-driver which eats most of the RAM, use too much more and you'll get a fault.